The teardrop shape of the Iris Wedding Bands symbolise power and majesty, the petal segments each set with pear shaped diamonds cascade elegantly forming the perfect frame for your engagement ring. Shown in 18k Yellow Gold, 18 Round Brilliant Cut diamonds, VS2, 0.18ct total carat. The Iris Wedding Bands fit perfectly with the Callida Engagement Ring or the Aura Engagement Ring. The Iris Wedding bands create the perfect teardrop arch shape. Iris, in ancient greek translates as 'rainbow', and the goddess Iris was thought to use the rainbow as a bridge between heaven and earth. 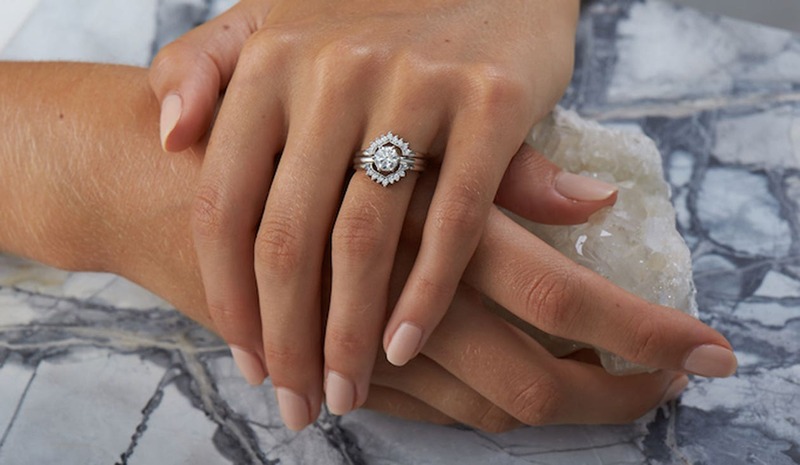 This shape reflects a symbol of power and majesty, the petal segments each set with pear shaped diamonds cascade elegantly forming the perfect frame for your engagement ring. "The day was awesome we had so much fun. We kept it a big secret from everyone..We hired an actor to be a fake celebrant and she was The BEST! She was so fruity... All my friends were being so polite. Half way through her script ... Gareth saidâ€¦. Sorry Tans I just canâ€™t do this..this is just not me, itâ€™s kind of weird. I wish weâ€™d just got married!! The crowd went mental and cheered!" "We met Tania and Gareth in our Auckland store and drew some designs that would suit their lifestyle and commitment ceremony. Halfway through making their rings, their ceremony turned into a surprise wedding."